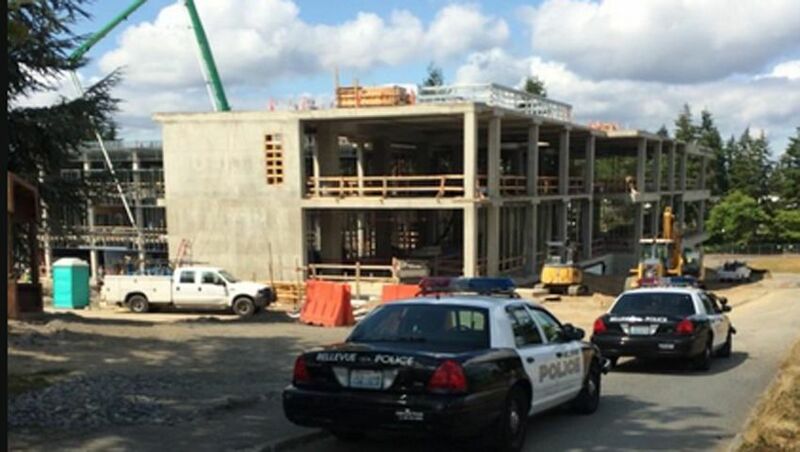 Officials with the Bellevue Police Department say a worker was tragically killed in an accident at a construction site on the Bellevue College campus Monday morning. Investigators say that Bayley Construction is working on a construction project at the college, but that the 31-year-old man who died was working for subcontractor Evergreen Erectors, Inc. Witnesses saw the man fall from a ladder approximately 50 feet above the ground. According to witnesses at the scene, the unidentified construction worker was reportedly wearing a safety harness designed to keep him from falling at the time the incident occurred, but investigators said they were unsure if the harness was actually attached to anything before he fell. The Washington State Department of Labor and Industries – commonly referred to as L&I – has said that Evergreen Erectors, Inc. had been cited for two serious safety violations “related to forklift operations” back in 2013. L&I also added that the company had previously undergone a safety inspection in 2012 that resulted in no violations or citations. Bellevue police and L&I will continue to work together to investigate the circumstances that resulted in the possible wrongful death of this man. From a legal standpoint, understanding who was responsible for ensuring workers at the construction site were equipped with proper fall protection and safety gear will be one of the most important factors to determine. As you may already know, on-the-job injury claims are typically investigated and handled by L&I, and victims of these accidents usually need to consult with an attorney with experience specifically handling L&I claims. This is primarily because if a person is injured on the job, the primary source of recovery for their injuries would be through the workers’ compensation process. However, those who are injured on the job as a result of the negligence of another third-party contractor – as appears to be the case in this particular instance – may pursue a personal injury claim against the actual third party subcontractor. These types of construction accidents can be extremely difficult to handle and may require the assistance of an experienced attorney. These claims are inherently more complex and difficult to pursue than other types of personal injury claims, and accident victims may benefit from discussing their legal options with our staff by contacting us or calling our office at 206-727-4000.